We all know volcanoes due to past lava flows make super fertile patches of land to grow tasty fruits, veggies and high quality wine. But the jet-black flanks can also be sculpted into a volcanic deluxe resort, with lush gardens and private access to the sea. When the dark, hardened soil meets an elegant, sophisticated architectural design that perfectly blends in with the surroundings, the result can be astonishing. 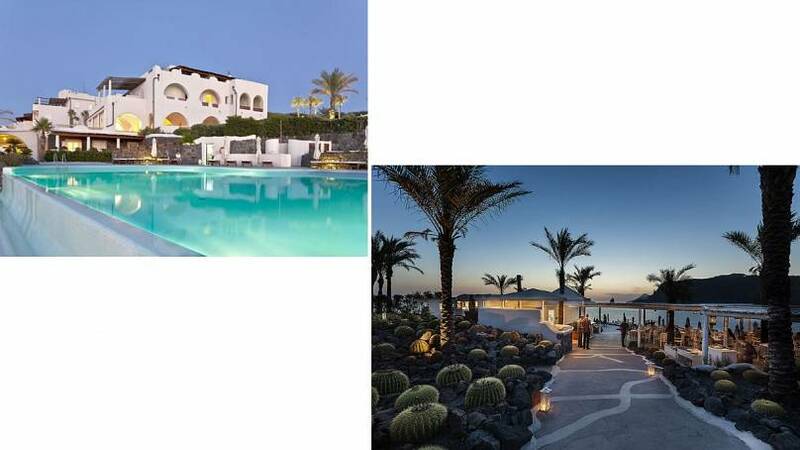 The Therasia Resort Sea&Spa rises on an extinct crater on the isle of Volcano, in the chic Aeolian archipelago. It's a heavenly, élite retreat where uncontaminated, wild nature rules. 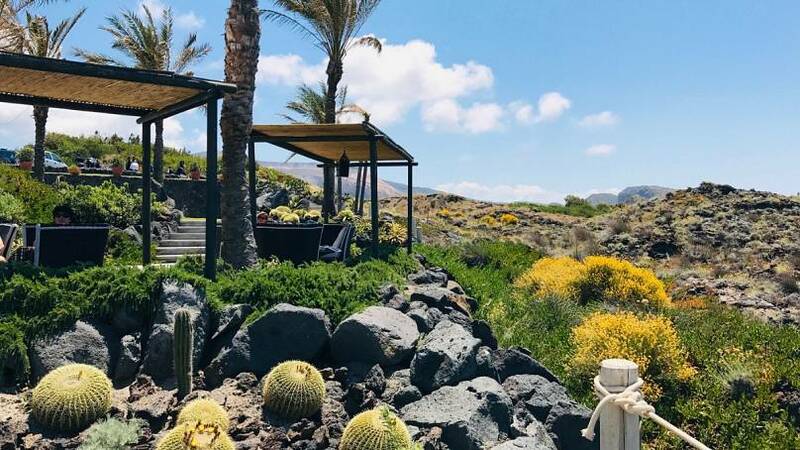 This exclusive, eco-friendly hotel is located (solo) in the most stunning and secluded part of the island called Vulcanello, far from the active craters and the stinky sulphurous mud baths. No nasty vapours reach this oasis of peace. Actually, the resort is one of the few buildings around and is far from the buzz of the main fishermen village. Recently restyled from a previous dwelling, the white suite dwellings follow the bumps of the hilly landscape, clashing just in the contrast with the patchwork of dark volcanic rocks ranging from black and reddish-purple to yellow, orange and fluorescent green. The neat little huts where guests wait for the shuttle to take them down to the harbour are separated by jutting-out cactus plants of all sizes and colours, round as balls and tall as those found in US deserts, which have been kept in their original spots instead of being planted into vases. The resort rises inside what locals call the “monster park” featuring solidified lava rocks shaped like dragons and beasts, so while you sip a Martini at the open-air lounge bar you can enjoy letting your imagination run free by admiring a lava-pebble desert where rocky formations stand out as volcanic art works. It’s like stepping foot in a Mars-looking microcosm. 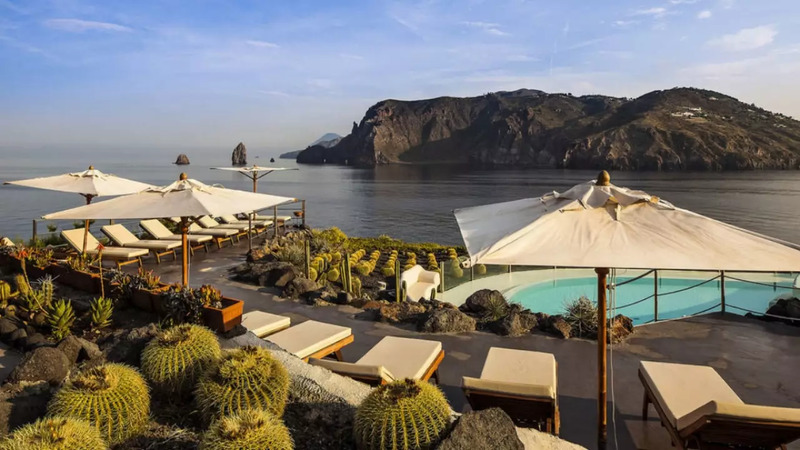 The resort’s main body is built on the many layers of the rough, spiky-pointed flanks of the dead Vulcanello volcano. There are various panoramic rock terraces connected by ragged stone paths that go down to a rocky platform where you can dive into a translucent, shimmering blue sea. The central terrace features a Michelin-starred restaurant and if you ever get tired climbing back up to your suite, you can stop to catch your breath at the many open-air jacuzzis carved from little crater holes. Sunbathing spots, with fountains sprouting out of walls, are built on natural rock floors. 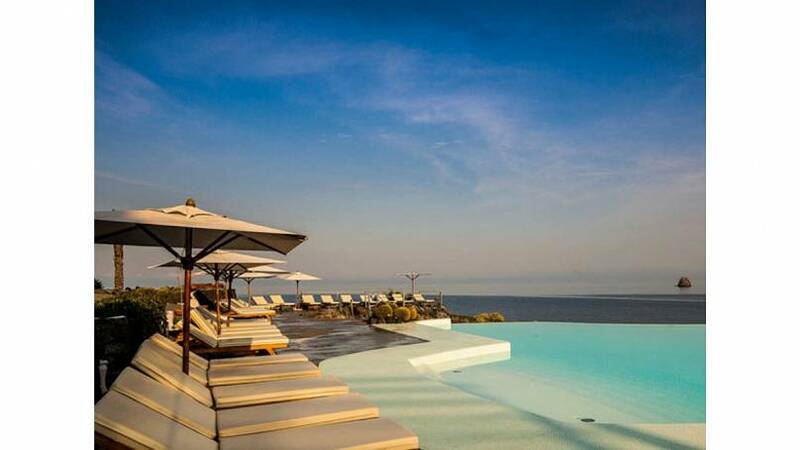 The most lavish part of Therasia is the infinity panoramic swimming pool which boasts one of the best views in Italy, popular for its bleeding sunsets. This is the only spot in the entire Aeolian archipelago from which you can admire all 6 other islands, including Volcano. Cocktails with local herbs are served at pagoda-style thatched bar lounges surrounded by prickly pear trees and wild shrubs. The chic design enhances the wilderness of the scenery and the unique experience even more. Therasia’s name in Greek means “land of fire”. The Ancient Romans believed it was the door to Hades, aka hell. You’ll have the chance to live a chapter of mythology. According to myth this is where lame, cuckold God of Fire Hephaestus lived, deep underground, serving as the official blacksmith of the Olympus. He was married to stunning Aphrodite who frequently betrayed him, triggering his anger which he was forced to vent out. From the resort you can take a fast-speed dinghy to tour the isle and dive into Aphrodite’s Pool, a submerged crater hole where the goddess would wash away her sins and emerge from the clear waters as a virgin once again. While swimming you’re bound to come across underwater fumaroles that act as natural jacuzzis, just watch out not to float too much time above one as you can burn yourself on the hot bubbles. The sulphurous gases oozing out of the seabed can make you dizzy and faint. Therasia’s rooftop spa is certainly a better alternative, especially for the 360 degree view of Vulcano. The hotel’s lobby inspires meditation. It’s huge with glass ceiling-high windows and doors leading to patios ideal for tea and coffee breaks. Lava sculptures, pottery and jewels decorate the corridors. The thought that your own suite was a once a former bubbly red hot lava chamber and you’re holidaying inside a crater sends shivers up the spine. But it’s just an initial thought that gives way to pampering. The deluxe apartments, with private terraces and tiny jacuzzis, feature precious lava decorated walls and floors. The black sleek bathrooms dotted with painted majolicas give a unique twist to the extravagant architecture. Who wouldn’t die to live just one day in such a blissful inferno, in a deep primordial contact with the most powerful element of nature - fire?